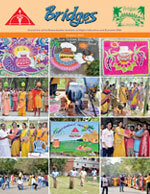 Pongal celebration in the campus every year is a time of great camaraderie and joy shared among the students, faculty and staff. These festivals with various games showcasing our culture and events to evoke the talents of students & faculty are valued moments that help us to establish unity and nurture our relationships. The student research convention program – ANVESHAN was a good platform to develop innovation & creativity among students, integrate ideas & learned concepts and gain experience in working together in an interdisciplinary setting.